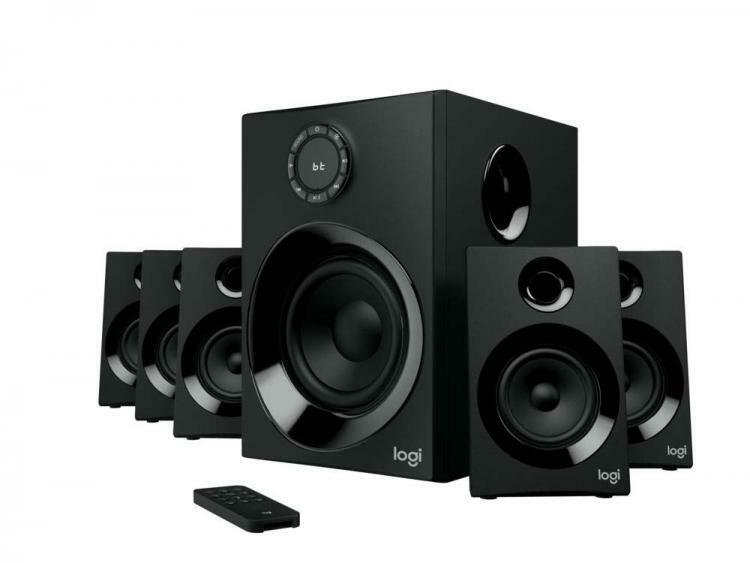 Logitech presents the Logitech Z606 5.1 Surround Sound Speakers with Bluetooth connectivity. The Logitech Z606 features powerful 160 watts of peak power and a 5.25-inch subwoofer that fills any room or space with immersive sound. The Logitech Z606 supports PCs, media players, phones and other sources using its flexible connectivity options including standard 3.5mm audio jack, RCA connector, and wireless via Bluetooth 4.2. The Logitech Z606 offers true 5.1 surround sound experience with its powerful 5.25-inch bass driver with 50 Watts Peak Power and 25 Watts RMS pumps out punchy bass, with an extra low-frequency extension added by a ported enclosure. The 5.1 speaker system puts out a Peak Power of 160W. The speaker drivers deliver clarity and high-frequency audio detail for immersive audio whether you are gaming or watching a movie. The Logitech Z606 5.1 Surround Sound with Bluetooth comes with extra-long 20-foot rear satellite speaker cables to complete a 5.1 setup in 33 feet of sound space. With the extra-long cables, satellite speakers can be placed anywhere with ease. The Logitech Z606 also comes with a compact remote control that enables the user to play, pause, skip tracks, control volume, and other functions conveniently and remotely. Logitech released an identical product, the Logitech Z607 5.1 Surround Sound with Bluetooth, back in November 2018 for the European market. The Logitech Z607 has additional features like an FM radio along with an SD Card Reader and a USB port that supports different audio file formats including MP3, WMA, WAV, APE, and FLAC. The Logitech Z606 5.1 Surround Sound Speakers with Bluetooth will be available in February 2019 at Logitech.com with an MSRP of $129.99USD. The Logitech Z606 is covered with a 1-year limited hardware warranty. Learn more about the Logitech Z606 5.1 Surround Sound with Bluetooth here.